Did you know it can take up to 700 gallons of water to make a single new cotton T-shirt? It’s why Savers challenged people everywhere this back-to-school season to save millions of gallons of water with one simple act: making their next new tee a thrifted one. It was only natural for our company to advocate for reducing the collective environmental footprint of clothing. We are built on the power of reuse and continually strive to sell reused clothing that serves both shoppers and the planet. Last month alone, we helped offset the use of hundreds of millions of gallons of water from people buying thrifted tees instead of new ones. Through this single act, people from across the United States and Canada showed they truly Give A Sh!rt about the planet. By asking people to Give a Sh!rt about their clothing footprint, we are asking them to engage in the reuse cycle, taking us one step closer to offsetting water consumption and conserving finite natural resources. While this success is a step in the right direction, clothing and textile waste is still a huge problem that is often overlooked. We all know about recycling paper, plastic and soda cans – some of us take it for granted. Too few people know that their clothing has an environmental footprint and that it can be reused and recycled. The fashion industry is quickly becoming the second most polluting industry in the world. People are not only producing, but also consuming more clothing than ever. 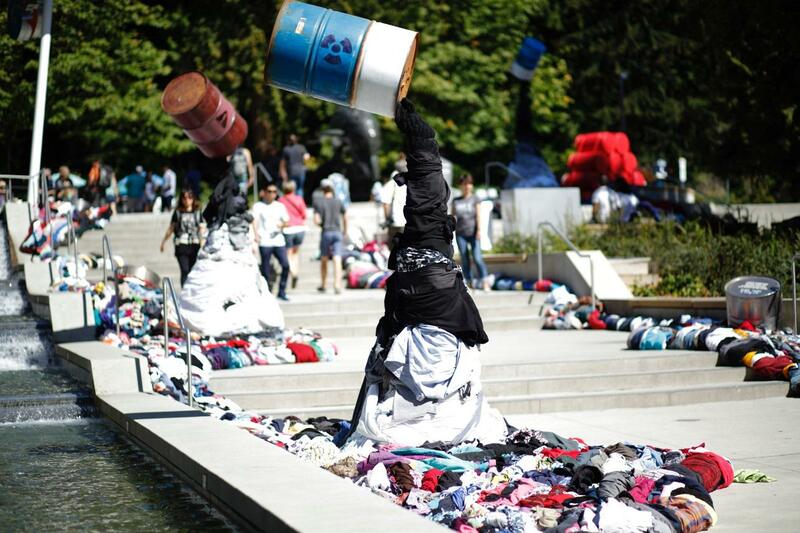 In fact, North Americans now consume 80 billion pieces of clothing every year – four times more than in 1980. And too often clothing is being carelessly thrown into landfills (26 billion pounds), when these items could have been reused or recycled (95 percent!). As we as consumers begin to realize the impact our clothing waste has on the planet, it is encouraging to see likeminded individuals and companies embrace what Savers has been doing for more than six decades. We were excited to have YouTube blogger iJustine partner with us on National Thrift Shop Day by cleaning out her closet and donating her unneeded clothing to a local nonprofit. She alone diverted over six trash bags of clothing from potentially heading to a landfill. Additionally, this past spring, Evrnu and Levi Strauss created the first pair of jeans from post-consumer garment waste using a new recycling technology. The garment was created from five discarded cotton T-shirts and used 98 percent less water than virgin cotton products. And now there are companies like Looptworks that are upcycling and creating products from excess material that otherwise would have ended up in landfills. Repurposing these materials allows Looptworks to create high-quality goods and conserve resources. What’s great about more people and organizations participating in the reuse cycle is that, collectively, we are helping to reduce the environmental footprint of clothing. Did you know there are several ways to rethink reuse? Make your next tee a thrifted one, and the one after that. Help us continue the #igiveashirt movement to offset water consumption and conserve finite natural resources by engaging in the reuse cycle. Donate your unwanted goods to a local nonprofit. Whenever you’re cleaning out your closet or getting organized donating is a great way to get rid of unwanted items. Not only are you helping nonprofits in your community, donating ensures the lives of items you no longer need are extended through the circular economy. Choose high-quality, sustainably sourced goods when possible. Together we can Give A Sh!rt to make a better world for future generations, because this is their planet too. Ken Alterman is the President and CEO of Savers.